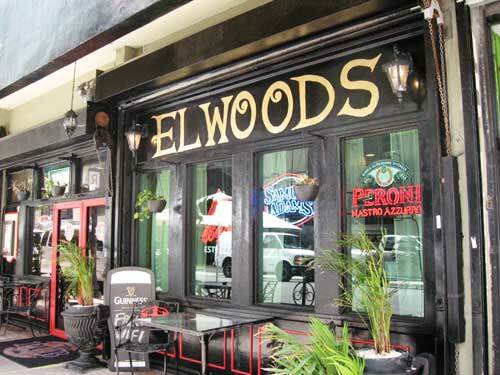 Not to be mistaken with pink-loving Elle Woods, or soul man Elwood Blues of the Blues Brothers, but Elwoods Gastro Pub in downtown Miami is just as charming and cool. 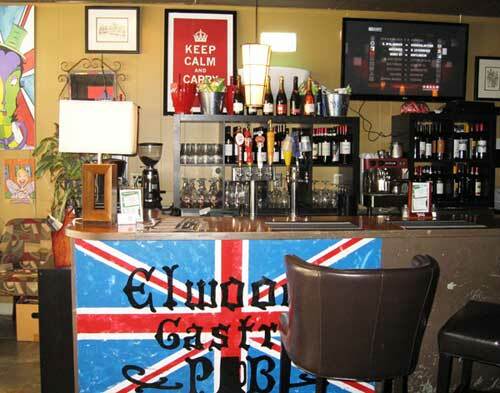 Owners Lorry and Louis Woods have poured their hearts and souls into this cozy eatery, featuring a variety of traditional English dishes and bar food favorites. And of course, there’s plenty of beer, including some rare finds. To our surprise, typical English cuisine is pretty broad. 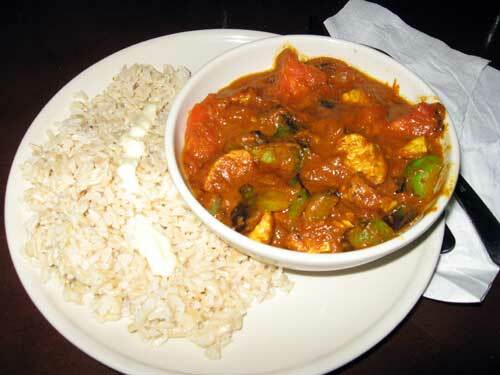 One of Elwoods’ specialties is stir fried Chicken or Vegetarian Curry ($9.50), made Indian-style with peppers, onion and tomatoes swimming in a homemade red curry sauce (mildly spicy). It comes with a bowl of texmati brown rice. 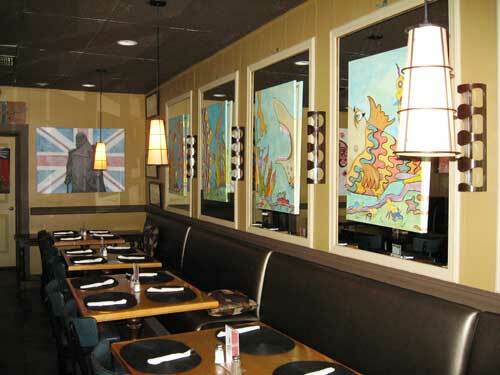 Bangers & Mash ($10.50) is another typical dish. They prepare it with Williams’ sausages, Cumberland and plain, served on mashed potatoes with onion gravy and peas. And then you have the better-known stuff. The Fish & Chips ($8.50 – $11.50), also available as Chicken & Chips, are made-to-order with a coat of beer batter and then fried to a golden crisp. But the best part is the house-style chips – sliced potatoes cut lengthwise in the shape of planks, fried and sprinkled with salt. They come served with homemade ketchup and mayo. These fries are so good, we can’t wait to go back and try some of their other variations, such as the Fresh Cut Sweet Potato Fries ($4) and Garlic Cheese Fries ($4.50) tossed with parsley, garlic, olive oil, feta and parmesan cheeses. You can never go wrong with a good burger. 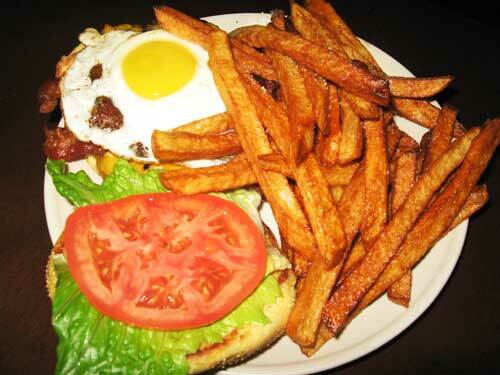 The Sunny Burger ($9) offers a twist on the traditional cheeseburger without going to far over the edge. You get a ground chuck patty topped with applewood smoked bacon, cheddar cheese, grilled onions, an egg cooked sunny-side-up, lettuce, and tomato on a Kaiser roll. All burgers and sandwiches come with fries (not the same as chips, but quite yummy too). 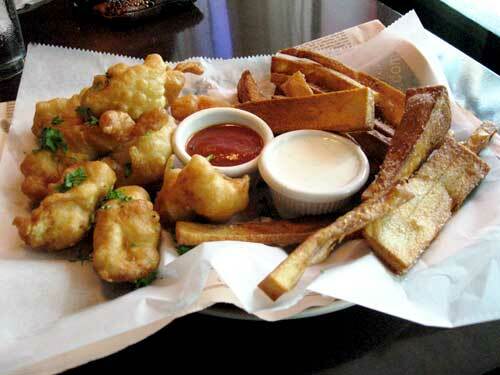 Elwoods also offers appetizers ($5.50 – $10), including beer-battered Fried Mushrooms, Cheese Nachos, Chicken & Beef Skewers, a and Cheese Plate, among others. Salads and soups range from $4.50 – $11. Add a small soup or salad to any main dish or burger for an additional $2. 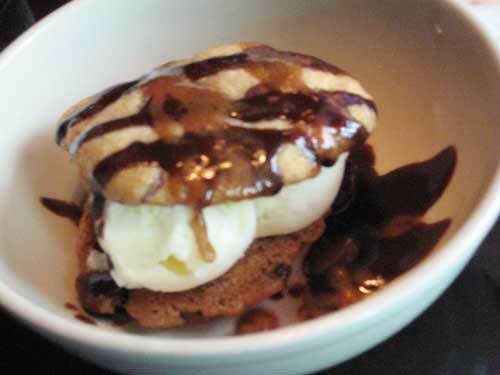 For a sweet finish, you MUST try Elwoods’ Choc Chip Ice Cream Sandwich ($4) – prepared with homemade vanilla ice cream and cookies baked on the spot, and then drizzled with caramel and chocolate sauce. Delicious! Just make sure you order while still working on your entrée. It takes about 20 minutes to prepare. Check Elwoods’ site for happy hour specials and upcoming events, such as live improv comedy and trivia night. Tuesday through Friday, noon to 11 p.m.
Saturday & Sunday, 11 a.m. to 11 p.m.
Leila, thank u for your positive feedback and for bookmarking our page!